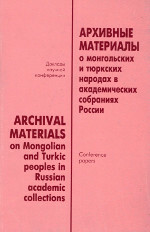 Archival Materials on Mongolian and Turkic Peoples in Russian Academic Collections. Conference papers / =Архивные материалы о монгольских и тюркских народах в академических собраниях России: Доклады научной конференции / Compiled by I. V. Kulganek. Executive editor S. G. Klyashtornyj. Ed. by I. A. Alimov, I. V. Kulganek, E. V. Pavlova. St. Petersburg: Peterburgskoe Vostokovedenie Publishers, 2000. 160 p. ISBN 5-85803-148-Х. On June 14, 2017, at the IOM RAS the third St. Petersburg Conference Current Issues of Buddhological Studies will be held in the IOM RAS.